It’s the season of newborn moose in Anchorage. Here’s your annual reminder to steer clear. Ken Marsh remembers driving down the Glenn Highway as an Anchorage college student in the 1980s and spotting a man trying to put a moose calf in the trunk of his car. Marsh pulled over to ask what was going on. "He says, 'Oh, I saw this baby moose by the side of the road, it's abandoned, so I don't know, I'm going to take it into town I guess,'" Marsh, now a spokesman at the Alaska Department of Fish and Game, recounted in an interview Friday. Don't do that. Don't try to rescue moose calves, he said. Don't even get close to them. 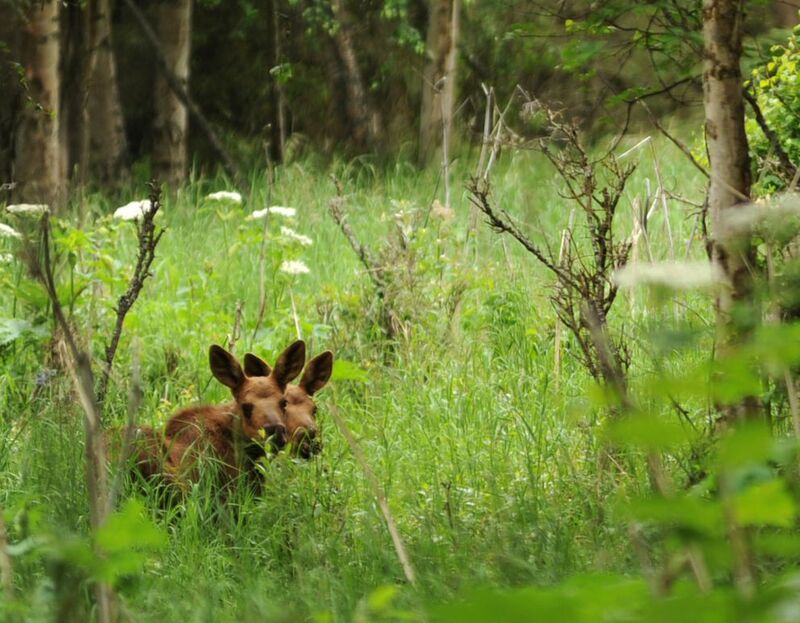 May marks the season of newborn moose in Southcentral Alaska, and with that comes reminders from Fish and Game about how humans should behave around the animals both in the wilderness and in Anchorage, where it's not unusual to see a moose eating leaves in your backyard or ambling down the sidewalk. 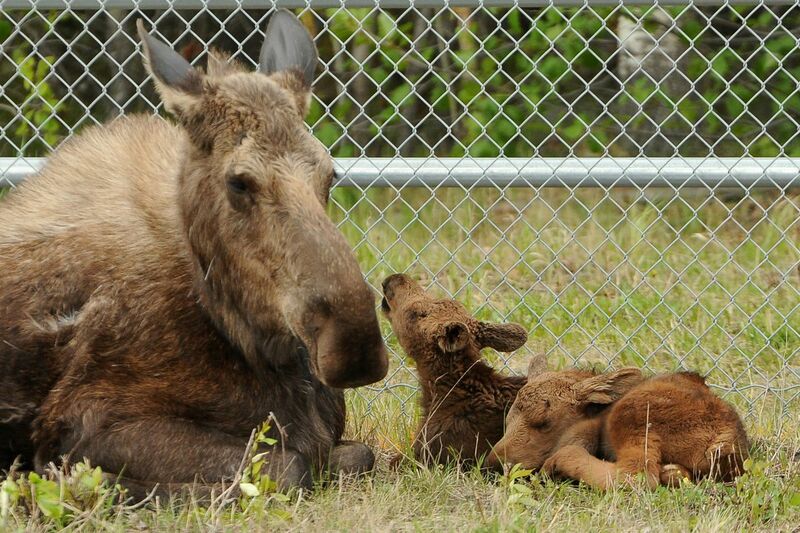 — Do not try to rescue moose calves: Most moose calves that appear orphaned are not actually orphaned, Marsh said. It's not unusual for a cow moose to walk off and temporarily leave its calf in a place it feels is safe. "They look like they're abandoned, just sitting off the side of the trail, so you want to go off and pet them or rescue them or something like that, and before you know it, there's mama," Marsh said. You don't want to mess with a protective mother moose, he said. If you see a lone calf for a long period of time (think: in the same place for about 48 hours), you can file a report with Fish and Game, Marsh said. The time frame is long because cow moose often return to feed their calves when people aren't around. "It could be 3 a.m. or just when crowds have dispersed," he said. If the situation involves an immediate public safety concern, contact Alaska State Troopers. Do not try to feed or pick up the animal. That type of contact is illegal and may result in a fine. — Give them plenty of space: Give moose plenty of room, especially a cow moose with calves. Cow moose can be particularly dangerous during calving season. Moose births typically peak around the third week of May in Southcentral Alaska and then continue through June, Marsh said. Since newborn calves can't run from pets or people on bicycles, cow moose are likely to stand their ground even if they hear you coming down the trail, according to Fish and Game. "Stop, turn around and come back the way you came," Marsh said. Do the same if you see a calf alone. You may have walked between it and its mother. Last year, Fish and Game killed a moose reported to have attacked and injured four people in an Eagle River neighborhood. It was the first cow moose with calves killed for aggressive behavior in the Anchorage area in six years. — Don't stand your ground: Often, moose flee if they feel threatened. But sometimes, they become aggressive. If a moose does charge you, you should run or walk away quickly and get behind something solid, like a tree or a car, Marsh said. "Get something between the two of you," he said. "They always say don't run from a bear, but it's the opposite with a moose."